There are actually quite a few people that have been face to face with Jesus. Not just Apostles or Prophets, or the Three Nephites, but regular people, some inside the church, but perhaps most outside the church. So, I am going to start this thread with a video from a previous Muslim that was in prison and figured he was a very good Muslim. Everyone should watch this video. I couldn't decide about this guy. He may have taken a little too much LSD. But, I am not his judge and his story is told in a manner that may be received by some. In any event, he did not say anything harmful. There are those that would take his word ovwer a suit and tie. Your right Floyd, that video of the ex-good-muslim is something that everyone should see. 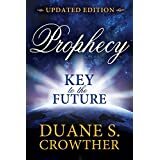 The book: Prophecy-Key to the Future book by Duane Crowther is a great book. I recommended in my book that everyone should read Crowther's book. This is the review I did on Prophecy Key to the Future with Crowther's timeline of the last days in bullet-point form. The material above is related to a book that I authored: "The Last Days Timeline"
For up-to-date info see talk titled: "What the Scriptures Say About Donald Trump -How Long Will He Last?